A well crafted and fitted Saree blouse is your perfect companion to the saree. Designer blouses that are versatile in their appeal can be excellent additions to your wardrobe to add oodles of grace befitting a royal lady. Saree blouse designs can be inspired from many sources like retro styles, Bollywood eras or by the works of best Indian designers. Add some exuberant designs to your collection and feel like a queen! The way in which a saree/sharee is draped differs from one region to another. However, the three main components of this beautiful Indian dress or ethnic Indian attire remain the same, and they are the saree or the drape, a blouse and a petticoat around which the saree is draped in a wonderful, stylish and gracious manner. An Indian Saree Blouse is usually well fitted and ends right at the waist, baring the mid-riff between the blouse and the petticoat. Saree blouses form an important part of the overall appearance of the saree. A delicately crafted and well fitted blouse can add oodles of charm to a plain saree and an ill-fitted and boring blouse can take away the appeal of even a designer saree. It is important to choose your blouse carefully as the blouse as a well matched and fitted blouse can exponentially increase the charm of the saree. Blouses can be designed in numerous ways, from graceful and subtle to stylish and chic, and a lot depends upon the individual’s preferences and whether it is matching the saree that it is to be paired with. Designer Saree Blouse designs can take inspirations from Bollywood celebrities and popular Bollywood designers like Manish Malhotra and Tarun Tahiliani or even Sabyasachi. Bollywood inspired blouses are highly preferred by young girls due to their contemporary designs that match the trends in vogue. These days, Saree Jackets or jacket blouses are also common to spot and these are the collared styles with mandarin collars or other types of collars attached that add a graceful and elegant look to a saree. Jacket blouses look poised and charming and are perfect to be worn at workplaces. Jacket blouses can be sleeveless or full sleeved. 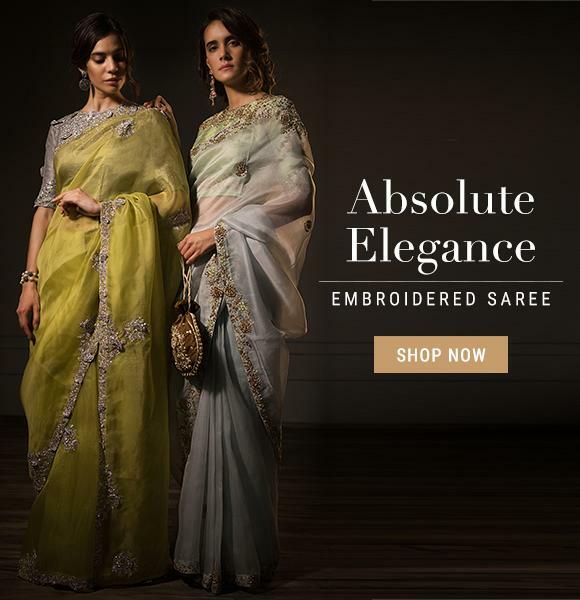 KalkiFashion offers you the opportunity to shop online for saree blouses in a plethora of exclusive and extravagant designs, styles and embellishments to suit your taste, and you may buy Saree Blouses online with or without a saree. Choose from a wide spectrum of colours, latest saree blouse patterns and embroideries with contrasting and multi-coloured options to add some versatility to your wardrobe. Buy designer and Bollywood style saree blouses at Kalki Fashion and be a diva every day! Yes, they are extraordinary indeed as each and every item displayed here are hand woven to perfection by some of the skilled weavers who knows their trade like the back of their hands. The design, style, color and fabric material, all complement each other as they bring about that gorgeous appeal in a woman who desires to look stunning and sensual in a designer blouse. Our designs take inspiration from some of the leading Indian fashion designers who have created a niche for themselves in the Indian fashion scene and among them; the most prominent ones are Sabyasachi Mukherjee, Manish Malhotra, Ritu Kumar, Tarun Tahiliani, JJ Valaya and so on. Come winter, summer or spring; we bring for you some of the most beautiful saree blouse designs that are simple ‘jaw dropping’ and can be worn for all occasions. We’ve brought for you an array of stylish, classic and contemporary blouse designs in Zari, Zardozi and Brocade work that transforms your look and enhances your appeal to many folds. The rich colors, beautiful prints and intricate design patterns are a treat for the eyes as we bring for you designer cholis and blouses that are truly Indian in appeal. Kalki Fashion is a brand in India and no doubt why some of the top Bollywood celebrities, TV actors, business tycoons and sports personalities come to Kalki in search for designer blouses in diverse patterns and style that oozes out beauty and sensuality. At Kalki, the blouse patterns depict grace, elegance and class that is desired by every single girl or woman who has fond understanding of fashion and these classic jacket blouses are the best examples of traditional Indian designs and clothing styles. When it comes to saree blouses designs, our exclusive designer collection is the first choice among all fashion conscious divas that have a love for ethnic Indian wear and traditional Indian clothing that is flawlessly created from the best quality fabric. The Gold and Silver brocade work, Zari work, embroidery work are all executed to perfection and our inspiration always remain Bollywood celebrities. Quality is never compromised as the fabric material and the colors used are of the finest quality. Weddings are always a special occasion for every house and to add to the icing on the cake, it is the clothing or the attire that enhances the beauty of a woman who wish to look the best on that special day. Be it the bride or the bridesmaid, they want to look absolutely dazzling and sensual. It is therefore the latest blouse designs along with the designer bridal saree that makes a girl look at her all time best. She cannot ask for anything better and when the bridal clothing belongs to a brand like Kalki Fashion, sky’s the limit. Mumbai is one fascinating cities that has people from all walks of life and it is here, people have a love and understanding for fashion as it is probably the fashion and style capital of India. It’s no wonder why you find some of the best fashion labels and fashion stores in India, here at Mumbai or Bombay that exclusively deals in women’s clothing or women’s ethnic wear that is beautifully handcrafted. 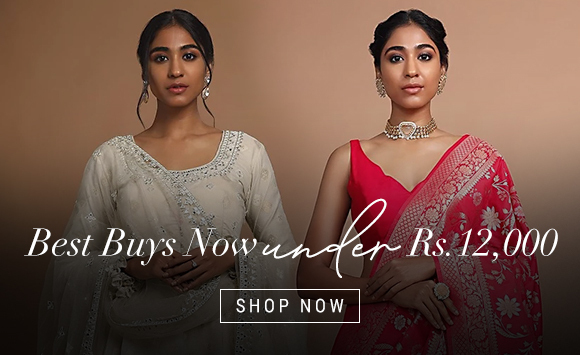 Shop your heart out for beautiful blouses, bridal sarees, embroidered sarees, wedding gowns, bridal lehengas & cholis that are simply gorgeous in appeal. Simply because you don't’ have to go to a tailor and explain him / her exact cut, style or design you want, spending hours giving measurements that is sometimes embarrassing. Today, you just need to visit a designer fashion clothing store for women online and pick your style of party fashion wear or wedding attire from an array of designs that is showcased on its gallery. If you are looking to buy readymade blouses online, Kalki Fashion could be one of the best bets as they offer you a stylish range of readymade blouses online for every occasion that is outstanding in terms of design and craftsmanship. Kalki Fashion brings for you a whole new range of women’s bridal wear that is bound to exceed your expectation and provide you with something that is worth your money.